Five awesome card tricks using a completely normal deck! IN YOUR FACE TRANSPO -- An Ace of Spades trapped between two Jacks transposes with a selection. Super clean! ALL THREE KINGS (with John Guastaferro) -- A four of a kind revelation that happens completely in the spectator's hands! RED HOT ANNIVERSARY -- Red Hot Mama meets Anniversary Waltz. Totally impromptu! COLLECTION KICKER -- A clean "Collectors" routine with a great kicker ending. SLEIGHTLESS SIGHTLESS -- Mind reading, clarivoyence and precognition rolled into one amazing effect! 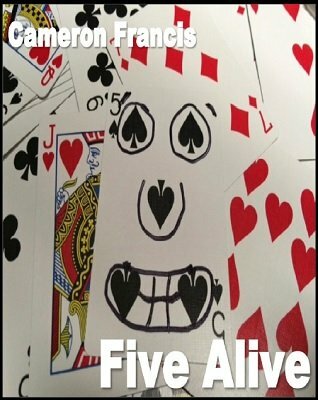 Five Alive is a PDF which includes links to performance and supplemental videos. The skill level of the tricks ranges from self-working to intermediate. 1st edition 2015, 14 pages.